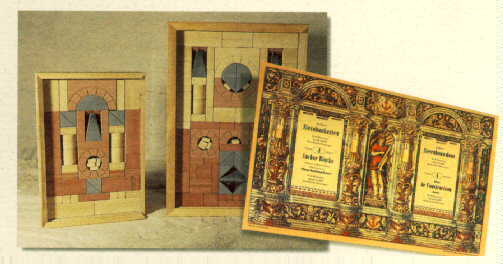 New stone building sets and puzzles are being made again, and in Rudolstadt, by Modellbaustein-Spiele GmbH, Breitscheidstr. 103, D-07407 Rudolstadt/Thüringen, Germany. Tel: 03672 / 5 25 55; Fax: 03672 / 5 25 52; e-mail. These wonderful sets are beginning to be imported into the USA once more. In February of last year these sets were reintroduced at the American International Toy Fair in New York. Because the retail distribution of Anchor sets and puzzles is extremely limited, as a service to people who want to buy these new sets, I keep a few on hand and will send them, post paid, upon receipt of a check. (Special shipping, such as UPS-Air, is extra.) I am not operating a business, so I have no arrangements to accept credit cards. Last year's "Christmas crush" was very heavy, but all sets are now on hand. If you want to buy old sets (generally higher numbered sets not offered [at least not yet, if ever] as new sets), check the old sets for sale page. If you want to buy some loose new stones, check the loose stones page. I have been surprised that many of the buyers are adults who intend to build with the sets themselves. I do hope that they let the youngsters have a turn. I have been told that the set # 12A will be finished in time for the Nuremberg Toy Fair in early February, 1999. If you would like to buy a set or two, some stones, or have questions, please don't hesitate to contact me by e-mail. For those who are really interested in Anchor stones, I have written a book about them. (I just got tired of either looking up the same information again and again, or trusting my memory on specific details such as dates and names.) It is expensive, $70 (or 100 DM) ppd, because I print it myself on my PC and color ink is expensive. The book undoubtedly contains far more information about Anchor stones and sets, the Richter company, etc. than you'll ever want to read. This book is a lot of work to print (I print about a dozen at a time; it is available in either English or German), so please don't think I am urging you to buy one.